Nokia has introduced the World's first 41 Mega Pixel (MP) Camera Smartphone and amazed the world with the 41 MP Camera beauty in a Smartphone. The Nokia's latest 41 MP Smartphone is known as "Nokia 808 PureView Smartphone" with fully loaded features and catchy eye candy design. The Nokia 808 PureView Smartphone integrated a 41 MP Sensor, which captures image data from seven adjacent pixels and condenses it into one, resulting in stills at around 5 MP resolution with amazing detail and low noise levels. The optics are Carl Zeiss and there's Xenon flash and a LED one acting as a video light. Nokia had introduced world's first 41 MP Smartphone "Nokia 808 PureView" at Mobile World Congress 2012 (MWC 2012). Yes, that’s right you heard; a forty-one megapixel camera. Nokia's 808 PureView Smartphone is a first device featuring what Nokia calls its ‘PureView imaging technologies’ actually doesn't contain a 41 Mega Pixel Camera but it is having a 41 MP Camera Sensor. The 808 camera doesn’t take 41-megapixel photos; it collects 41 megapixels of data and uses all that data to create a very nice photo of a much smaller size. Nokia 808 with its high-resolution sensors and sophisticated software are capable of taking pics of up to 38MP resolution, the camera will "capture seven pixels of information, condensing into one pixel for the sharpest images imaginable". Technically the sensor is able to capture 3 MP, 5 MP, 8 MP, 38 MP at 4:3 aspect ratio and 2 MP, 5 MP [Default], 8 MP, 34 MP at 16:9. Nokia 808 with its superior low-light performance and the ability to save in compact file sizes for sharing in email, MMS, and on social networks, the Nokia 808 PureView makes it possible for anyone to capture professional looking images in any conditions. 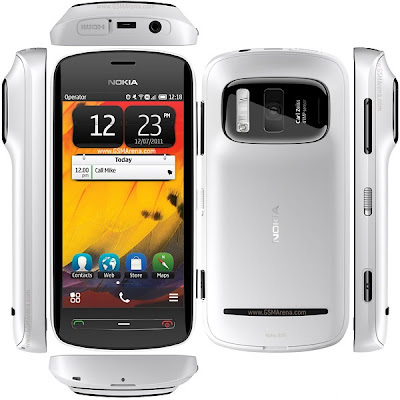 Nokia 808 is the first kind of its high definitions 41 MP Camera amongst various Smartphones available today. 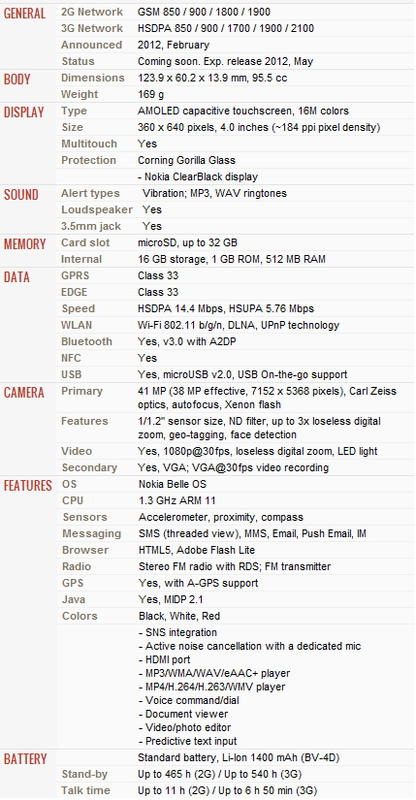 Following are the Specifications, Hardware and Software Details of new Nokia 808 PureView Smartphone. According to Nokia Website, Nokia 808 PureView is expected to be release in May 2012 with the starting price of €450. Nokia 808 Pureview Price in USA $610 Approx. Nokia 808 Pureview Price in UK €450 Approx.